A few weeks ago President Obama signed several immigration memos directing certain actions be taken. We have provided an overview of each memo several weeks ago. This article will discuss President Obama’s memo to clarify the criteria for an L1B specialized knowledge employee. While it has been a full month since the memos were announced, there has not yet been any clarification. Unfortunately this does not do immigration lawyers and their clients ready to file L1B specialized knowledge cases much benefit. The decision is to either wait for the memos to come out and restructure the cases as needed, or to just file and make future adjustments if necessary. What is L-1B visa? Who is it for? After researching many recent USCIS AAO appeals decisions, most of which were denied, we identified an important factor in L1B cases. The most important factor is comparing and contrasting the difference between ordinary knowledge and advanced knowledge. This may seem easy, but in practice it is very challenging and requires getting inside of each client case and getting the details of what distinguishes this person’s knowledge from others and why this knowledge is important to the overseas and US employer. To gain this information, it is a time consuming process both for the employer and the immigration lawyer. The hope is that a memo in the near future will clarify the definition of specialized knowledge and perhaps reduce the scrutiny placed on these cases. The benefit will be a less time consuming process saving employers time and money and providing a little more clarity for adjudicators and immigration lawyers. 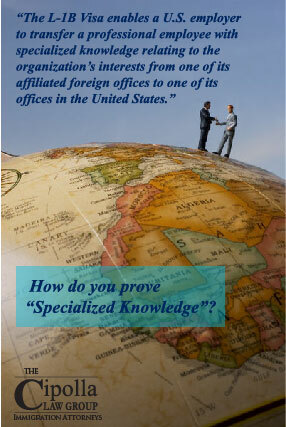 We will keep you posted on whether USCIS provides a memo on L1B specialized knowledge. In the interim feel free to contact our immigration lawyer in Chicago for a consultation.